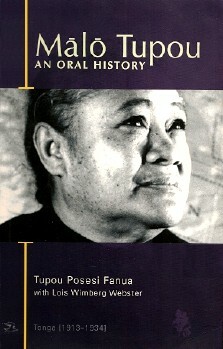 Malo Tupou : an oral history / Tupou Posesi Fanua, as told to Lois Wimberg Webster. - Auckland : Pasifika press, 1996. - XIX-175 p.- p. of pl. : ill., maps ; 24 cm. Tupou Posesi Fanua y est née en 1913 ; elle raconte les vingt premières années de sa vie — twenty years a growing … à Nuku'alofa : « Anything I wanted to do, I did. Anything I wanted, I got … It's no hard to see that by the tender age of five I was well on the way to becoming the self-willed, spoiled brat that I still am today ». DESCRIPTION : Born in Tonga in 1913, Tupou was an only child and, in her own words, « a spoiled brat ». At the age of 81, Tupou recounted her memories of her first twenty-one years to Lois Webster. Set in Nuku'alofa and involving several schools, a variety of overprotective relatives an odd romance, this is a fine, rambunctious life from an excellent storyteller with annotations by oral historian Lois Webster. The result is a compelling oral history of early twentieth century Tonga from a woman's perspective. Lois Webster has skillfully annotated verbatim transcripts of her taped interviews with Tupou and supplemented the text with maps and photographs. Above all, it is the voice and character of Tupou, this strong Tongan woman, that brings vigour and humour to a profound book.